A reader of JUST GENESIS who is also a member of the Facebook forum "The Bible and Anthropology" has written: "I'm curious if you know of a Biblical Commentary on Genesis that would give the historical events as you do on the blog? (I like what you did with the story of Noah, for example)." I provide a list of Bible Commentaries on Genesis here. It is not a comprehensive list, but it provides a broad range of writers and perspectives. I should write a commentary also, but so few people read these days that I wonder if it is worth the effort. We live in a time when you are heard only if your voice is louder than the other voices in the room, or if you can state your position in 10 words or less. Honestly, it would be impossible to reduce nearly 40 years of research into a pithy paragraph about the roots of the Messianic Faith extending back into deep antiquity and how Genesis reveals a shift from the divine Father-Son relationship to YHWH who has no son. The YHWH cult enters the picture about 700-250 BC, long after the time of Abraham and his Horite Hebrew ancestors. YHWH does not have a son. Therefore, we find the introduction of a new idea about God, one that expresses the Jewish understanding of God and is removed from the Proto-Gospel with its understanding of the divine Father and divine Son. There are competing narratives in Genesis that produce contextual incongruities. Messianic references are found throughout the Bible and the kinship pattern of the Messiah's people is consistent from Genesis to the Gospels, but the Messianic Faith of Abraham and his Nilotic ancestors becomes suppressed under the final hand of rabbinic Judaism in which there is no Son of God. 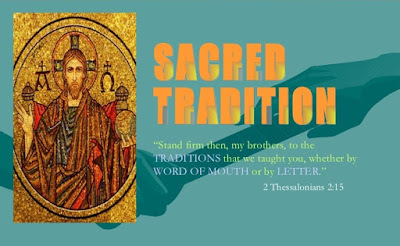 Nevertheless, we know which is the older tradition. It is the one which speaks of the "Seed" of God (Gen. 3:15) coming into the world and trampling down the serpent. The work published at JUST GENESIS attempts to reconnect Christianity to that older Tradition. We discuss this at The Bible and Anthropology Forum here, for those interested. In my research I've attempted to focus on data rather than on viewpoints and interpretations. This is an empirical approach to the study of the Bible and I refer to the work as the science of "Biblical Anthropology" to distinguish it from theological anthropology which is, in my view, highly speculative. This project has stimulated my growth intellectually, spiritually and socially. I have made friends with people around the globe and I hope the research has helped some people to better understand the Bible. I believe the whole of the Canon makes sense only when seen through the lens of the Messianic Faith. Madison Gentsch, my friend and long-time reader, knows my work represents "anthropological sleuthing" of the pre-Abrahamic origins of the Messianic Faith. I am often asked about my sources. I suppose that is implied in the reader's question about a Biblical Commentary on Genesis that would give the historical events as I do on the blog. The sources are too numerous to cite, but the reader who follows links in the articles and pursues the topic further by attending to the articles under "Related reading" will find satisfaction. My work is based on the earlier work of Bible scholars, anthropologists, linguists, and philosophers. None presents the material as I do, but many present the data upon which I base conclusions. 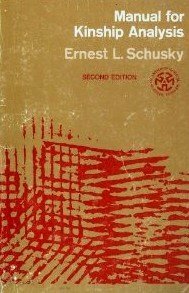 I owe my knowledge of kinship analysis to the great anthropologist Ernest L. Schusky. His "Manual for Kinship Analysis" is always ready at hand. Without this knowledge I could not diagram and analyse the marriage and ascendancy pattern of the biblical Hebrew. Nor could I prove that the persons listed in Genesis 4, 5, 10, 11, 25 and 36 are historical persons and their kinship is authentic. The work of Umberto Cassuto has been very helpful. According to Cassuto, Lamech is related to the Akkadian word lumakku, meaning “priest” (Commentary on Genesis, Vol. 1, p. 233). The word indicates a junior priest of the Hebrew ruler-priest caste, and is related to the Akkadian words maklu - burnt offering, and malku - ruler-priest (which is sometimes a synonym of Šarru - king). In his extraordinary Commentary on Genesis (Volume 1), Cassuto wrote concerning the lifespan discrepancies of the rulers: "What is the cause of the divergences between the three texts, and which recension has preserved the original figures? Much has been written on this subject, and the answer remains in dispute" (p. 265). Cassuto believed that the original figures are preserved in the Masoretic text and if we pursue this we discover the trail of Cain (7), Lamech the Elder (77) and Lamech the Younger (777). 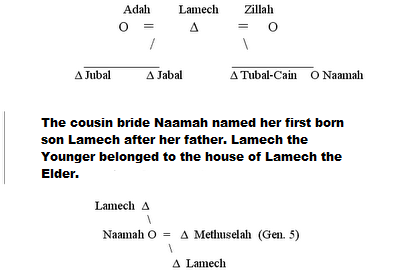 Lamech the Younger is the father of Noah. This Lamech is assigned the number 777, symbolic of full righteousness. E.A. Speiser's Anchor Bible Commentary on Genesis helped to clarify for me the way that a ruler and his grandson would have the same name. For example Lamech the Elder and Lamech the Younger. However, Speiser missed that this is due to the cousin bride's naming prerogative. Analysis of the kinship pattern of the Horite Hebrew shows that the ruler had two wives. That is made clear in the cases of Lamech, Terah, Abraham, Jacob, Amram, Moses, and Elkanah. Now we see why Speiser's translation is a good one. He distinguishes between two wives and two firstborn sons. Deuteronomy 21:16 forbids breaking the kinship pattern by giving to the firstborn of the cousin bride (the second wife) what rightfully belonged to the firstborn son of the sister bride (the wife of the man's youth). Speiser also contributes to our understanding of the term "Qanyty" as having an Akkadian context which, if we scratch deeper, we find is really the Kushite context of Nimrod's kingdom. Nimrod was a son of Kush (Gen. 10). In Genesis 4:1 Cain's mother gives birth and declares, "Kaniti (qaniti/qanyty)." This is interpreted to mean Kain/Cain. However, this is an Akkadian word that is related to the Nilotic suffix "itti" referring to rulers. "I have gotten a man, as has YHWH" should read "I have begotten a ruler..."
This is a Messianic reference. Kaniti/Qanyty is a reference to a king, born by God's grace. This is the second Messianic reference in the Bible. The first is Genesis 3:15, which refers to the "Woman" (not Eve) who is to bring forth the Seed of God who tramples down the serpent. The Akkadian itti, as in itti šarrim, means "with the king" or "for the king." It is attached to the names of royal persons and dignitaries. Even today the Nilotic Oromo attach itti to names: Onditi, Kaartuumitti, Finfinneetti and Dimashqitti. That itti is associated with Nilotic rulers is evident in the name of the great Egyptian queen Nefertitti. Kain has many linguistic equivalents: Qayan, Cain, and Kahn, as in Genghis Kahn, and the female variant is Candace or Kandake. All these words refer to a king/queen or ruler. The first kings named in the Genesis king lists are Kain and his brother Seth. They were Middle Bronze Age rulers as is evidenced by the technologies mentioned in Genesis 4-6. They were not the first people on earth. This is evident from analysis of the Genesis 4 and 5 lists where we discover that Cain and Seth married the daughters of a ruler named Enoch. These daughters named their first born sons "Enoch" after their father, suggesting that they were the cousin brides of Cain and Seth. 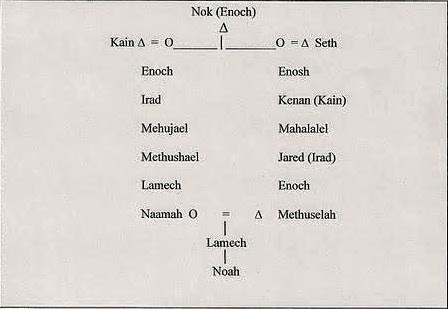 Enoch is a royal name. It refers to "one who ascends." Enoch would have been a contemporary of Adam. Modupe Oduyoye, a Nigerian philologist wrote "The Sons of Gods and the Daughters of Men" and that book helped me make connections between Genesis and African names and religious practices. The book was published in 1984 by Orbis Books, Maryknoll, New York. In his book, Dr. Oduyoye notes the connection between Adamu Orisa (of Lagos State) and the Hebrew r’ison Adam. He notes that Hebrew Qayin (Kain/Cain) and the Arabic word for smith "qayn" are cognates. He says these words are related to the Yoruba Ogun and Fon Gun, both meaning “patron saint of smiths.” Other examples include Ebira Egene (the metalworker caste) and Hamn Kuno (who is credited with the invention of iron smelting). Oduyoye notes that the Hebrew Nod נוד and Nok נוך are almost identical and this invites word play. Kain is said to have wandered in the land of Nod, but that could be Nok in Nigeria, as scholars recognize that the Genesis writer makes this a play on words. If Nok, we have Kain in the vicinity of Lake Chad, Noah's apparent homeland. I came to a better understanding of the binary (versus dualistic) worldview of the biblical Hebrew by reading the work of the anthropologist Levi-Strauss, and the philosopher Jacques Derrida. The French anthropologist Claude Lévi-Strauss observed binary thinking among pre-literate Amazon tribes in the 20th century. In his book, Le cru et le cuit, Strauss explores cultural perceptions of natural/raw-prepared/cooked, and other binary oppositions/sets within primitive cultures. Lévi-Strauss dedicated himself to searching for the "underlying patterns of thought in all forms of human activity." On the basis of his anthropological findings he argued that the primitive mind has the same structures or patterns as the civilized mind. These observations culminated in his famous book Tristes Tropiques, which positioned him as the central figure in the structuralist school. Jacques Derrida was a French-speaking North African Jew whose thought has contributed to a better understanding of the Semitic interpretative approach to meaning. Derrida's argument is that in examining a binary opposition and reversals, deconstruction brings to light traces of meaning that cannot be said to be present, but which have metaphysical existence. In reality, this is not a new approach to meaning. It is consistent with the binary thought and observations of the Abraham's Horite Hebrew ancestors from whom we receive the binary narratives in Genesis. The Bible scholars, anthropologists, linguists, and philosophers mentioned in this post provided me with good ideas on how to approach the biblical texts in a more empirical way. However, the data I use to pursue a clearer understanding of the antecedents of the Messianic Faith are dug out of the Bible. Archaeologists dig artifacts to gain a better understanding of the material culture of populations living mainly in the "Holy Land." Biblical Anthropologists dig data out of the Bible to better understand the culture and social patterns of biblical populations from Africa to Europe. The skill sets of the two disciplines are different, but they share a common objective to gain greater clarity. Over the years I have had to learn many ancient Egyptian words and ancient Akkadian words in order to make linguistic connections. That led me to compile a lexicon for each, which I hope will be helpful to readers. For those who wish to dig deeper, I recommend beginning with the INDEX. Finally, thank you dear readers for following this blog. Some of you have been with me for over 10 years. God bless you all.